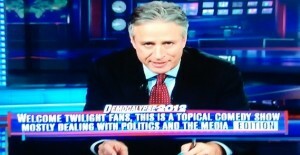 Brookelockart: hahahhah, he has to explain the Daily show to the new audience. Brookelockart: me too. Like he rolled out a special welcome mat for us. Brookelockart:Do you think Robstens lean right or left? UC: I could. but if you make me answer…. Well- some want EVERYONE to leave ROBSTEN alone, which I assume includes the government– so therefore they lean right…Some ROBSTENers though feel entitled to ROBSTENs relationship– and they probably love social security & medicaid too, so they lean left. I so smart. Brookelockart: “@PaulRyanGosling: Hey girl, I just ate a corn dog. Don’t ask. Don’t tell.” all the giggles! Brookelockart: So back to Rob on this show… do you think Jon showed him the questions before hand? because after his last appearance, I have to imagine Jon pitied Rob. That interview was so awkward that I had to keep looking away and changing the channel. UC: oh yeah… i actually completely forgot about that interview…. i mean.. it … seems so long ago! Brookelockart: It quite possibly was the most awkward interview that I’ve ever seen. Even worse than him being called a palsey chicken at comic con. UC: do we know that person who screamed in the audience. I bet we do. Or was that me? ICE CREAM… good call Jon– nice touch. Also WHAT FLAVOR IS THAT so I can go buy every one at my local Wawa. Brookelockart: Wait. do YOU KNOW THAT? About him being Lactose? UC: BROOKE– of course i don’t know that. i’m NORMAL remember? Brookelockart: Has rob completed a sentence yet? Brookelockart: aww, Jon’s a nice big brother friend..even though after he probably walks back to the staff and says, effing idiot. UC: yeah….. this is first right? cuz this is the BEST first interview possible. And can we agree that he really DOES need a publicist? 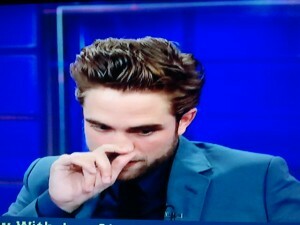 UC: um don’t pick your nose rob. but YES.. the hair… and the blue suit.. ugh.. hot..
Oh Rob… this is your life??!!!! *note: Brookelockart is Jewish and has never dated a Jew. Unless you count that one guy in 7th grade. Which I do and she doesn’t. So what does a friend like me do? Send her pictures of available Jewish guys all the time. Hot, not, small, fat, old, young. You’re welcome Brooke. 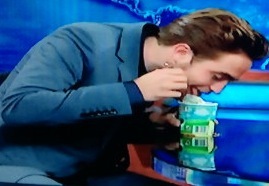 Ps: You can pick you friends and you can pick your nose, but you can never pick Rob Pattinson’s nose.